The United Nations Security Council today extended the mandate of the UN Integrated Peace-Building Office in Guinea-Bissau, known as UNIOGBIS, for an additional 12 months so that it can continue to assist the country in its path towards peace and reform. Under its renewed mandate, which will begin on 1 March 2016 until 28 February 2017, UNIOGBIS will continue to focus on supporting an inclusive political dialogue and national reconciliation process to strengthen democratic governance and work towards consensus on key political issues, particularly with regards to the implementation of necessary urgent reforms. The Office will also focus on providing strategic and technical advice and support in implementing the national security sector reform and rule of law strategies, as well as developing civilian and military justice systems that are compliant with international standards. In 2014, the West African nation concluded a second round of presidential elections, which are widely seen as essential to restoring constitutional order, economic growth and development following a 2012 military coup. 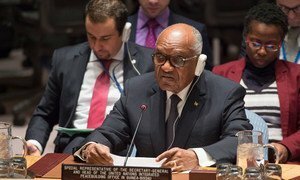 Nevertheless, in a recent briefing to the Security Council, Miguel Trovoada, Special Representative of the Secretary-General for Guinea-Bissau and Head of UNIOGBIS, warned that the political impasse in Guinea-Bissau could delay implementation of critical reforms and erode progress in the country's development. In today's resolution, the Council stressed the need for the Government of Guinea-Bissau to continue to take “concrete steps” towards peace, security and stability in the country, by effectively reforming the security sector, tackling corruption, and improving public administration and the supply of basic services to the population. The Council also expressed concerns over the “ongoing political and institutional tensions” among the President, the Prime Minister, the Speaker of Parliament and heads of political parties. It called upon the leaders to work together to consolidate progress made so far, and to address the root causes of instability, with particular attention to political-military dynamics, ineffective state institutions and rule of law, impunity and human rights violations and abuses, poverty and lack of access to basic services. In addition, in the resolution the Council reiterated its concern at the threat posed by drug trafficking to the country's peace and stability, and welcomed efforts in combating the issue. The Council also decided to review, seven months from now, the sanctions measures established under resolution 2048 (2012). Previously, the Council has expressed its readiness to consider targeted sanctions against those involved in the coup if the situation in Guinea-Bissau is not resolved. The political impasse in Guinea-Bissau could delay implementation of critical reforms and erode progress in the West African country’s development, the United Nations envoy there warned the Security Council today.